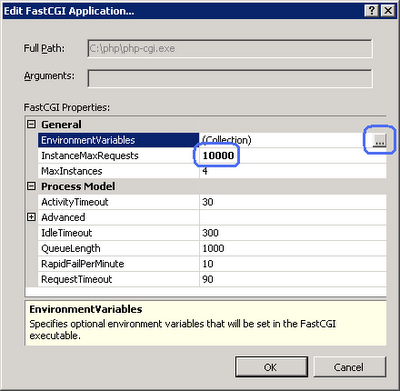 On the server level, double-click FastCGI Settings. In the Edit FastCGI Application dialog box, set the InstanceMaxRequests to 10000. Next to the EnvironmentVariables setting, click the Browse (...) button. 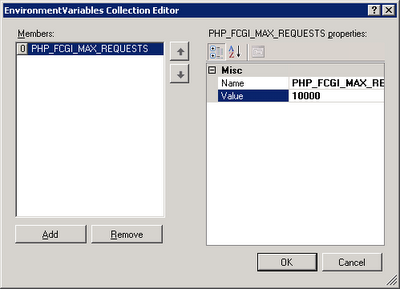 In the EnvironmentVariables Collection Editor dialog box, add the PHP_FCGI_MAX_REQUESTS environment variable and set its value to 10000. Note: If you do not configure these settings, the following default settings will be used: instanceMaxRequests = 200, PHP_FCGI_MAX_REQUESTS = 500 (on most PHP builds).